Share the wonderful travel experiences with you! Winter is coming!!! Have you got a good idea for your winter vactaion? After reading the recommendation from the Heilongjiang Province Tourism Administration, I think you can get one. Their recommendations are: 9 tourism festivals, 8 themed tourist products, 10 classical winter tour itineraries and 20 travel highlights. The 9 tourism festivals including China-Heilongjiang Internationl Skiing Festival, China-Harbin International Ice and Snow Festival, China’s Snow Tow Tourism Festial, and some other 6 famous winter festivals. The China Heilongjiang International Skiing Festival was initially sponsored by the National Tourist Bureau and the Heilongjiang provincial and the Harbin municipal governments in 1998. In in the past dozen years, the festival has attracted more than 17 million skiers from all over the world. This winter, the sponsors will mainlypromote the cross-country skiing programs with the flavor of northern China, including leisure cross-country skiing, fitness skiing for kids, polar skiing and eco-hunting skiing. As one of the world’s largest ice and snow festivals, the “Harbin International Ice and Snow Festival” is on a par with Japan’s Sapporo Snow Festival, Canada’s Quebec City Winter Carnival, and Norway’s Ski Festival. The festival has been held since 1963. It had been interrupted for several years during the Cultural Revolution untilit was resumed in 1985. The festival is officially celebrated from January 5 to the end of February every year. It has become a fabulous amalgamation of ice and snowsculptures, culture, arts, winter activities, winter sports, adventure, food, and business fairs. The 8 Top Winter Tourist Products of China: dreamlike ice and snow art tour, exciting fitness skiing tour, interesting ice and snow folk customs tour, splended ice andsnow landscape tour, magical ice and snow tour for health preservation, featured ice and snow culture tour, romantic ice and snow flavor tour, and red ice and snowtour (a tour package concerningthe Chinese communist party during the War of Resistance against Japan). The 20 winter travel highlights in Heilongjiang Province including: Harbin Ice and Snow World, the Snow Sculpture Expo at the Sun Island, Harbin Ice Lantern Fair, Harbin Volga Manor, North Pole Christmas Village in Mohe, winter landscape in Jingpo Lake, Snow Castle in Mudanjiang, watching birds in Zhalong Nature Preserve, China’s Snow Town, hot springs in Lianhuan Lake, the volcano, ice and snow landscape in Wudalianchi, witer scenery of the Tangwanghe xing’an stone national geological park, the landcape of the snow pines in the Wuying Forest Park, the rime wonders on the banks of the Kuerbin River, the ice and snow happy valley in Songhua River, thewinter fishing of the Hezhes in Jiejinkou of Tongjiang City, China rime valley in Linkou County, winter fishing in Xingkai Lake, the rime marvels in Xinhua Lake (Daqing City), and the charming daylight in the snowfield of the Fuyuan County. The Harbin Ice and Snow World is probably one of the world’s hottest entertaining destinations right now, even if it is made out of ice and snow. 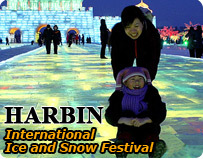 The Ice and Snow World has been annually held in Harbin since 1999. It is one of the major venues for the International Ice and Snow Festival, officially opens on January 5. The park features many large ice and snow sculptures based on landmarks from countries around the world, which are lit up by color-changing LED lights, looks very beautiful, and hence the best time to visit the park is at night. The Snow Sculpture Expo is one of the most popular attractions of the Harbin International Ice and Snow Festival. It is a themed park based on the mighty beautiful snow sculptures and interesting winter activities. Covering an area of over 600,000 square meteres, the manor rebuilt and diplay many Russian style buildings of Harbin in last century. This attraction is a must see for those who want to know some facts about the Harbin architecture.